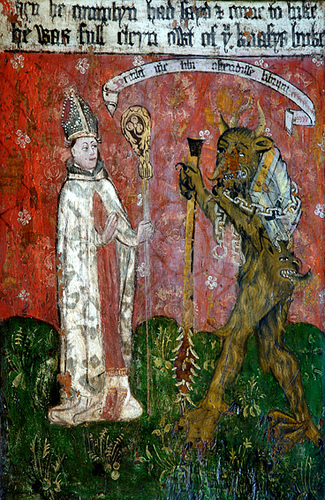 St. Augustine was the first Church Father to consider at length stories of ghostly apparitions that appeared in various strands of hagiography, legend, scripture, and eyewitness testimony. It’s not truly a “theology of ghosts,” but it’s a more developed consideration of the subject that anyone else, even Tertullian, had attempted, or indeed would attempt for centuries. Augustine firmly rejected the idea that the dead could return from the afterlife to make themselves visible to the living. The idea that a person who saw a ghost was seeing, essentially, the soul of the departed was impossible. He addressed the issue is his letter to his friend Evodius (Letter 158 from Evodius and Letter 159 from Augustine) and in a treatise addressed to Paulinus of Nola called On the Care to Be Given to the Dead. Evodius was a friend and follower of Augustine who eventually became the Bishop of Uzalis. His letters to Augustine often prompted prolonged discourses. In Letter 158, Evodius tells a complicated story of multiple waking and sleeping apparitions of known dead people who come to either predict a death, or reveal the fate of someone already dead. Evodius appears to accept these as legitimate experiences of the departed, although it is notable that he was eyewitness to none of them. Evodius uses this story to ask whether the soul, upon leaving the body after death, takes with it some other kind of body which enables it to move and appear to the living. In addressing the question of sightings which include verifiable facts and predictions of the future, Augustine acknowledges that he has no explanation for them. As for the visions of the dead, he clearly places them in the realm of spiritual vision and refers Evodius to Book 12 of Genesis, which I discussed in a previous post. Our brother, Gennadius … told us that he doubted once … whether there was any life after death. As God would not abandon a man of his disposition and works of mercy, there appeared to him in sleep a handsome youth of dignified mien, who said to him: ‘Follow me.’ He followed and came to a certain city, where he began to hear, on his right, singing of such exquisite sweetness that it surpassed all known and ordinary sweetness. Then, as he listened, he asked what it was and his guide said it was the hymns of the blessed and the saints. I do not clearly remember what he said he saw on his left. When he awoke, the dream vanished and he thought of it only as one does of a dream. But, on another night, behold, the same youth appeared to him again and asked whether he recognized him; he answered that he did so fully and perfectly. Then the youth asked where he had known him. He remembered what to reply to that, too, and described the whole vision and the hymns of the saints which the other had led him there to hear, recalling them with ease as a recent experience. The other said: ‘You remember well, it is true, that you saw all that in a dream, but you must know that even now you see, although you are asleep.’ When he heard that, he believed it was so and expressed it by his answer. He fell silent at this, finding no reply, and, as he remained in doubt, the youth made known what he was trying to teach by these questions. Thus this faithful man says that his doubt on this matter was removed, and what was his teacher but the providence and mercy of God? Every day man wakes and sleeps and thinks. Let him say whence come those thoughts resembling the shapes, the qualities and the motions of bodies yet not composed of corporeal matter. Let him say it, if he can, but, if he cannot, why does he rashly try to form some kind of definitive opinion about these very rare and unusual experiences when he cannot explain the constant and daily ones? As for me, words fail me to explain how those seemingly material bodies, without a real body, are produced; yet, as I know that they are not produced by the body, so I wish I could know how we perceive those things which are seen sometimes by the spirit and are thought to be seen by the body, or how we are to distinguish the visions of those who are deluded by error or impiety, when they are generally described in the same terms as the visions of the good and holy. Bracing clarity and honesty from Augustine: when he doesn’t know an answer, he admits it. He suggests that the mysteries of ordinary life are enough to occupy our energies without recourse to rare and disputed phenomena. Tomorrow, I’ll finish talking about Augustine’s ghosts by looking at his On the Care to be Taken For the Dead (De cura pro mortuis gerenda), which includes yet another of his ghost stories. For someone who didn’t believe ghost stories, he seemed to relish telling them.